I didn’t expect to do this. I feel like I dumped all over you. I don’t usually act like this. 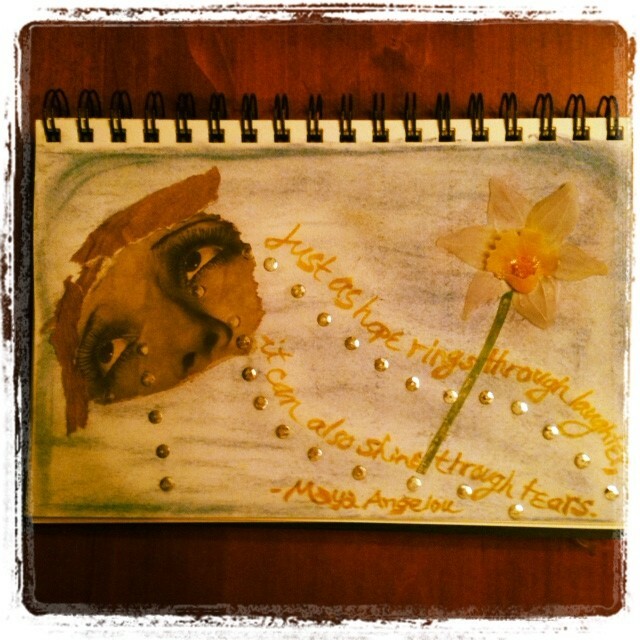 Of course, crying isn’t the only way my clients express themselves. They also talk and reflect. Tell their stories. Explore possibilities. Discover emerging desires. Laugh. Ponder. Play with expressive arts. Take actions that support what truly matters to them in life and work. It’s all good stuff. Including the crying. Yet it’s not unusual for any of us to initially feel vulnerable about letting down our guards and showing our emotions this way. When we cry in front of others we may feel at our most vulnerable. It can be a tender and fragile place. Your tears are a gift to me. I’m honored that you feel safe enough to shed them in my presence. And if you were here with me today and needed to shed a tear, I would say the same thing to you. If you’d like monthly-ish resources for Living Deep delivered straight to your inbox, subscribe here. You seem incredibly caring and empathetic. Your clients are lucky to have you. Oh, Sara, I am so touched by your words. Thank you. Your art journal page rocks. I love poetry wherever it pops up. Happy Art Every Day Month! I imagine your family delights in you, Julie! You sound delightful and full of the zest for life. I’m a big hugger too. I try to remember Virginia Satir’s minimum daily requirements for hugs: 4 for survival, 8 for maintenance, 12 for growth. On days I get 12 I am humming. I actually love the feeling of a good hardy cry. It relaxes the body and helps me to shake some of the stress. It feels so cleansing. A counselor asked me once, “What are the tears saying?” I’ve kept this question with me and pull it out to respond to tears, anger, jealousy, excitement, and any combination of fear-based or love-based emotions. It is so wonderful that you provide a safe place for people to explore their feelings and ideas. Thank you, Kathryn! By asking what the tears are saying, you’re really able to tap into those underlying feelings and be with them. Deeply good. What a blessing to be able to be part of people’s lives like that.